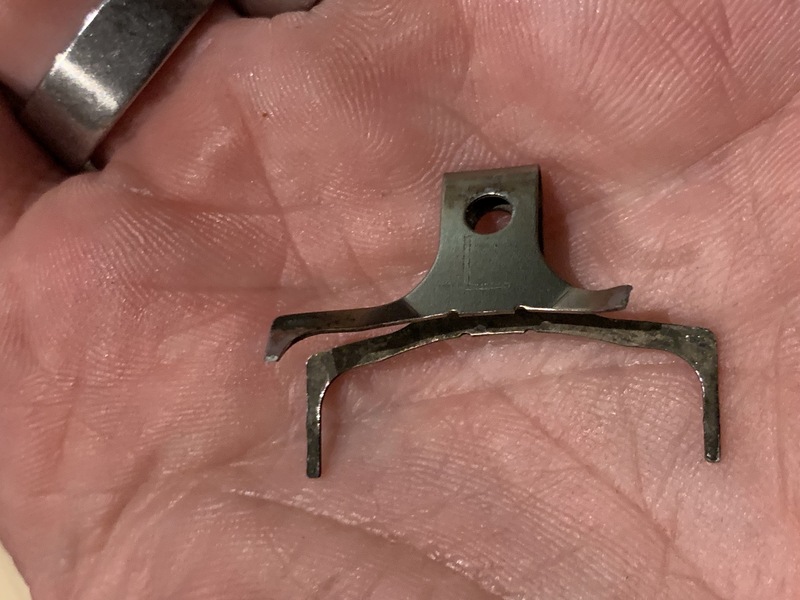 February 13th – I wore out a set of front brake pads, and still have a fair few part worn ones glazed out from the problems with the rear brake, which I wouldn’t throw away in case I found a way to reclaim them. I’ve been thinking about it idly, and I’ve managed to recover a set. I filed off the surface a little with a clean flat file surface. Filing alone doesn’t work, so working on the basis whatever has destroyed them must be oil based, I took the pads, placed them on an aluminium sheet, and gently heated them with a very hot plumber’s blowtorch for ten minutes, until they stopped smoking when I removed the flame. I then cleaned off the oxidisation with a scotchbrite pad and finally degreased them with a zero residue spray cleaner. They are as good as new. Without the heat, none of these steps have worked before. I guess you could stove the pads in a normal kitchen oven if you don’t have a blowtorch. It’s saved a few bob, I guess. Be interesting to see if they wear any quicker or glaze again. 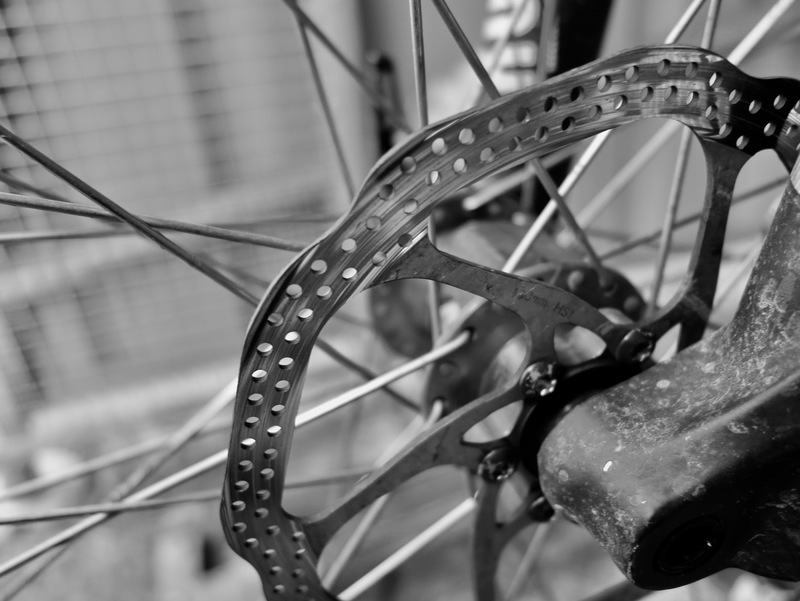 September 3rd – It’s been a while since I bored you with disc brake pads, so it’s your lucky day – or maybe not. I favour a hydraulic disc brake on all my bikes, road or off-road. On road bikes, I think the Shimano 785 based callipers are the bees knees; combined with a decent disc and pads, they control my resplendent girth down the steepest of inclines and without snatching. The only issue I have – and I’ve covered this before – is the mystery of what exactly happens to rear pads in particular when they overheat. Sometimes, despite the best care, pads will develop a sheen, lose the nice grip and squeal horridly. I’ve been trialling aftermarket alternatives all summer to see if other manufacturer’s inserts are better. I tried Kool Stop, an expensive brand. They were nothing special, and glazed out. Clarks performance was tepid, but lasted well. My best results have been with Uberbike sintered and semi-metallic. These are an interesting design – 785 road pads normally have a backplate with cooling heatsink fins. Uberbike have separated the two, so you can re-use the cooling fins on a slightly thinner pad, which are only £6 a set instead of the £20 for a set from Shimano. And they work a dream.I had one set glaze out near the end of life, but other than that, great. I thought the front set had taken the same dive while winding down from the Roaches the day before, becoming squeaky and losing friction, so swapped them in the workshop the next day, to find the pads had worn to the spring, and that was the wail. I really do recommend Uberbike pads. February 23rd – Back to brakes. This has really caught my attention, sorry. Following the brake trouble I’ve talked about where pads suddenly lose effectiveness in my hydraulic disc brakes, I’ve decided to try alternatives to the stock Shimano pads. I wasn’t expecting them to be any good – I was wrong. I’ve tried the Kool-Stop first. This company makes a very highly regarded road brake block, and I was interested to see how that translated. After initial disappointment, I’m actually quite impressed. These resin pads are described as having a ‘rotor saving compound’, which usually means they’re soft and not too effective. My fears seemed to be confirmed on the first two or three days of use, when stopping power was poor and the brakes noisy. I then rode in the rain. This appeared to bed the pads in and they’re now every bit as good as manufacturer originals in use. They aren’t quite as snatchy, which is good, to be honest, but they do bite when demanded. The question is, how long will they last? We shall see. But my initial feeling is that although they took an age to bed in, they’re great pads. Thanks for all the suggestions for answers to the sudden loss of braking power issue. The disc is not greasy, the pads are dry and the disc is only 0.06mm down from new thickness – although that one really did make me think, so cheers for the suggestion. I put in a set of Shimano pads. They worked fine once bedded in, without cleaning the disc. The old ones look glazed, and seems to be a grumble in online bike forums. I’ve decided to trial some aftermarket alternative pads to see how they fare in comparison – the red ones are Kool Stop, who are famed for old-style brake blocks, and the other set, with separate heatsinks are from Uberbike. The Kool Stops are at the pricey end of the market, the others, cheap. The interesting thing about the Uberbike ones is they come in synthetic, metal and semi-metal flavours, and you can buy the pad separate to the sink, so they’re cheaper. Got the Kool Stops in for now. I’ll report back. Again, thanks for all the advice. August 25th – One thing that is good about a wet ride is that it speeds up the bedding in of new brake pads. Last week I changed the ones on the front, and although greatly improved, that hadn’t yet reached best efficacy. A ride in the wet – with some nice hard stops from speed – works wonders, and the rain on the disc mingles with the metal dust from the disc and pads, forming a grinding paste that wears everything together quickly. On my return, I swill out the brake calliper and disc with a hose. The brakes are loads better now than they were before. I’ve never seen this documented anywhere, but seems to work a treat. August 19th – I’m fussy about brakes. Very fussy indeed. Urban cycling – particularly in heavy traffic – demands the ability to control speed and stop with certainty and dependability in all conditions. Since I discovered disc brakes a few years ago now, I’d never have a bike fitted with anything else. After using cable controlled versions – the excellent Avid BB7 – these days, I use hydraulic brakes by Avid (part of what used to be Sachs for old timers reading out there) and by Shimano. They are both excellent kit. Being hydraulic, however, they absolutely devour pads. Modern cycle disc brakes started on mountain bikes, where braking is usually short, or at relatively low speed. 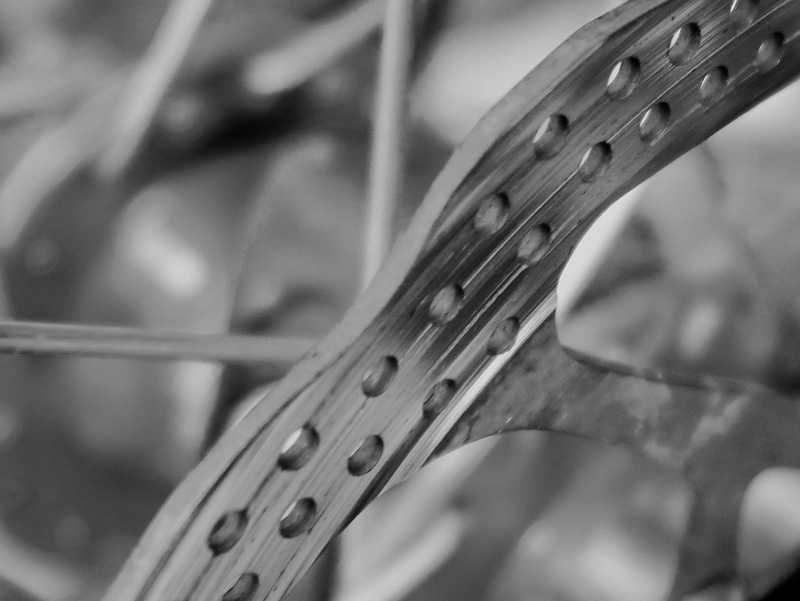 With similar units on commuting and road bikes, engineering questions of heat dissipation, wear and glaze on the pads are critical. Discs and callipers get fearsomely hot very quickly. It’s not unusual to see my discs steaming on wet rides. Prolonged use can cause the surface of the brake pad to become shiny and lose grip, ‘glazing over’, and the wear is constant. There are two general types of brake pad; sintered metal and resin (AKA ‘organic’) – sintered last a long time, are great in the wet but can howl in use and wear discs heavily. Resin pads wear quickly, are silent, and generally offer softer control and better ‘modulation’. I’ve been very, very pleased with the Shimano brakes, which have been on the bike for about 4-5 months now, but the resin pads they came with haven’t impressed me. The pads for these units come on a heatsinking vaned plate, and are very easy to change, which is a blessing as the rear set were never the same after I cleaned the bike using normal bike cleaner. The front ones glazed out a few days ago. I went to sintered on the back when they became poor, and was shocked at the huge difference made, and the fact that so far they’ve been silent, so today, I popped some in the front, too. (The new sintered pad is on the left; the knackered resin on the right). I must say, recent experience is leading me away from resin or organic pads.